Best Sump Pump For Your Money: Reviews and Buying Guide  to read through all the reviews, that's alright. Perhaps you know exactly the kind of pump you're looking for and just want to know the best choice. Use the links below to go directly to the reviews you need to read. If you’re not entirely sure what to look for, in a sump pump, please start with the section below. We believe it will help clarify the types available and their purposes. You can then check out the reviews with more confidence. Let's go over some of the basics of sump pumps and the terminology associated with them. What’s a Sump Pump For? All residential sump pumps serve the same basic purpose. They’re designed to prevent water that seeps down into the ground or up from aquifers from rising to the level of your basement floor. In short, they prevent flooding caused by ground water, irrigation and/or storms. These pumps are most often installed in a pit liner or basin with perforated sides that extends below the floor of your basement. The pit and pump are usually the final stage in a network of drain tiles and other devices designed to keep water away from the inside of the structure. Rising water in the pit raises a float that triggers the pump. The water is pumped to an exterior location where it drains away from the structure. One of the most important things to know about your sump pump is how it’s rated. There are two critical factors in the way it performs: The flow rate and the lift, also known as “head”. A typical rating will be stated in gallons per hour (gph) @ lift feet (ft or ‘). Why? Because the higher the pump has to lift the water to discharge it, the slower it will be able to move it. Know the vertical height of the discharge line for your pump and you’ll be able to estimate how efficient it will be. Although the job of a sump pump is simple, there are differences in design and purpose to be considered. Battery Powered Sump Pumps: There are generally two types of pumps in this category. One is designed as a portable pump, to be used in remote areas or emergencies. The other is intended as a backup when a main unit fails or is unable to keep up. A 12VDC battery is the most common option for both types. The backup type is usually installed with a dedicated battery. Backup Sump Pumps: In extremely wet or low-lying areas, a single sump pump may sometimes be unable to keep up. For those situations or when a pump or your power fails, a backup unit may save you thousands of dollars in home repairs. As mentioned above, backup sump pumps are often battery powered. Others use a venturi, powered by your home’s water supply. These stand-by pumps are usually started automatically by a second float switch, or a float-actuated valve for water powered models. There are two basic designs in electric sump pumps. One is intended to operate completely submerged, while the other has the motor mounted at the top of a pedestal and a long shaft that drives the pump at the bottom. Submersible pumps have fewer moving parts and of course, aren’t prone to moisture-related motor damage. They are generally shorter overall, which allows installation in shallower basins. Pedestal pumps are usually less expensive, but their life expectancy may be shorter and pumping rates tend to be lower. On the plus side, they may be easier to replace when they fail. If you know what you'll need your pump to do, this is the section for you. Take a look at our top picks in sump pumps by type and purpose here. We’ve chosen the PumpSpy PS1000 in this category partly because of its innovative technology. This backup system let you monitor your main and backup pumps’ performance remotely. Not only that, it also uses cellular technology to sense main pump or power failure and start the backup pump without the need for a second float switch. This unique system monitors your pump system 24/7, free of charge and sends instant alerts by email, SMS and/or the Smartphone app. It also tests your system automatically, 3 times per week and provides reports to multiple devices. The monitoring device/controller plugs into the wall outlet and the main pump plugs into its throughput receptacle. The connections to the 12VDC backup pump are also made on the back of the control unit. That and a few other simple connections are all that’s needed. The sump pump is small enough to fit beside most main pumps in a space the size of a 5 gallon bucket. Despite the small footprint, it delivers up to 1,625gph @ 15′ of lift. It’s also efficient enough to provide up to 5.5 hours of continuous run time with a 75 amp/hr battery. 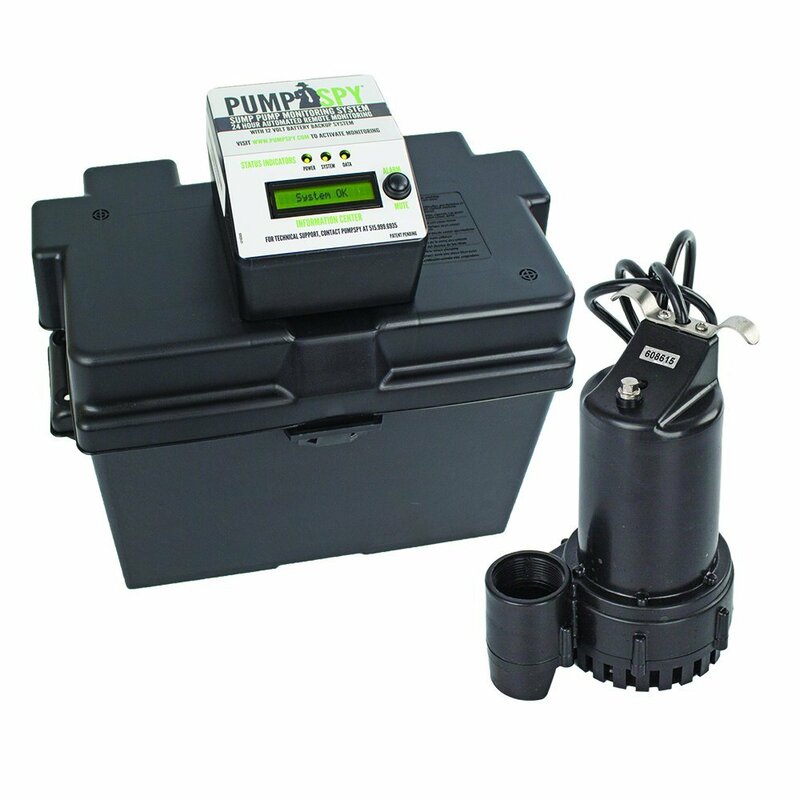 With all this power, simplicity, high-tech monitoring and operation we think this is your best investment in a battery-operated backup sump pump. Selecting just one pump as the best overall backup was a tough job. In the end, we based our choice on simplicity of installation, price and efficiency. 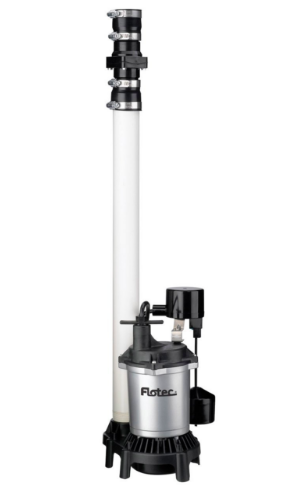 The SJ10 from Liberty Sump Pump is a compact, lightweight unit that installs easily, even for the do-it-yourselfer. It’s a water-driven backup pump with its own integrated mechanical float and valve. Simply place it above the sump basin with the float and suction tube at the proper level and plumb it up to the water supply and discharge pipe. The pumping rate is dependent on the pressure and volume of the water supply. This little beast discharges 2 gallons of waste water for every gallon of supply water. With a maximum head of 35 feet, it’s suitable for almost any average basement. You may be surprised to find a water-driven sump pump listed as our first choice for a backup unit. If so, consider that this pump requires no batteries or electrical connections. As long as there’s a water supply, this pump will continue to operate as needed until the crisis is averted. This simple backup sump pump solution may cost more to operate in some areas, but it’s reliable. Considering the cost of repairs to your basement and its contents, we think you’ll agree it’s a small price to pay for peace of mind. When you’re in a location that requires moving a lot of water quickly to protect your basement, you’ll want a submersible pump that’s up to the task. You’ll also want one that isn’t going to cost an arm and a leg to operate. The Liberty Pumps 287 sump pump fits the bill. This big guy sports a ½ HP, thermally-protected motor that drives the pump at up to 67gpm (4,020gph) with a lift of 37 feet. It can handle solids of up to 3/4”, so dirty water isn’t a problem. The 1-1/2” discharge ensures handling of the full delivery volume. It’s operated by an integrated, non-adjustable vertical magnetic float and switch so there’s no need to set levels. It’s designed to last, with a stainless steel rotor shaft, stainless steel removable bottom screen and permanently lubricated bearings. The motor is even hermetically sealed inside the cast iron housing. The slim design of the housing allows installation in sumps with a diameter a small as 10”. It comes with a 10′ electrical cord that features a quick disconnect fitting for easy replacement. Last, but not least, the motor features a design that can reduce energy consumption by up to 40%. For high-volume water removal and dependable, long-lasting service, this submersible sump pump is a solid investment. For those who prefer an above-water motor for easier adjustment and inspection, here’s a heavy-duty pedestal sump pump with enough power to handle heavy loads. The ECO-FLO EPP50 takes our top spot for this category. This model features a column-mounted, 1/2HP, capacitor-start motor and an integrated, top-adjustable float. It has a maximum lift of 20 feet and delivers 660gph at that height. It’s rated at 4,200gph @ 5 feet. Thermal overload protection built into the motor helps avoid premature failure. The non-clogging impeller and big, 1-1/2” discharge port allow it to handle 3/16” solids. With a height of 31.4”. the motor stays high and dry, well above the average sump opening. Since it’s only 9.28” wide, it fits in narrow sumps, too. The thermoplastic column and pump housing are lightweight, rigid and corrosion-resistant. This pedestal sump pump gives you the power and capacity to keep up with fairly high drainage rates. It does so with a lightweight design and easy adjustment access. Best of all, the price won’t set you back too far. For all those reasons, we believe this model delivers the best value for your money in a pedestal pump. Check it out at the link above and we think you’ll agree. For our top choice in a water-powered sump pump, we looked for a high flow rate, high lift and quick and easy installation. We found all three in this model, plus dual check valves and a high water alarm as bonuses. The Basepump HB1000-PRO starts with the brand’s innovative, in-ceiling mounted design. This provides the maximum pressure drop across the top of the suction pipe, maximizing the outflow potential as well as lift. It also facilitates simpler plumbing with a simple, straight-through path. Check valves prevent backflow into the suction line and ejector. The pump stays full and ready when backup is needed. The kit comes with brass fittings and push-in connectors for quick, easy hookup. A hydraulic float in the sump triggers the ejector to start the sump pump. Flow through the ejector simultaneously triggers the alarm, indicating that the water level in the sump has exceeded the safe limit. Only one parameter prevented this from being our top pick for a backup sump pump: It requires 10gpm of inflow from the water supply to operate at maximum capacity. In all other departments, this water-driven sump pump is a champ. Follow the link above and see for yourself. As a company known for manufacturing bulletproof sump pumps, Superior has a solid reputation for quality. Their 92341-RTG-P is a good example of the kind of quality you can expect from the brand. This unit is a breeze to install, with the motor, vertical-discharge pump, vertical float w/switch and elevated base all integrated. A pre-installed 1-1/2”, full-flow check valve and PVC riser simplify the process even further. There’s even a convenient top handle. The heart of the system is Superior’s 1/3HP motor and pump, designed to move 40gpm (2,400gph) reliably, efficiently and with low maintenance. Speaking of maintenance, the pump even comes with removable intake screens for easy cleaning. It’s compact, rugged, powerful and convenient. 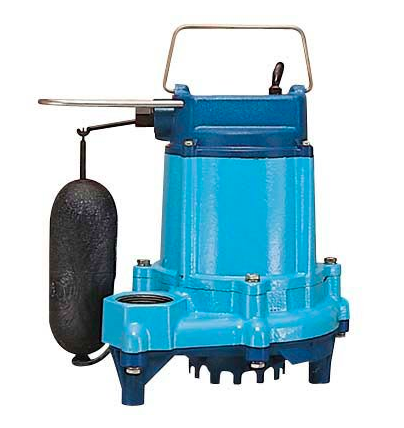 Follow the link above to read through the details about this submersible, cast iron sump pump and the company that manufactures it. We think you’ll see why we’ve included them in our reviews. This manufacturer designs and creates sump pumps known for their ruggedness and dependability. 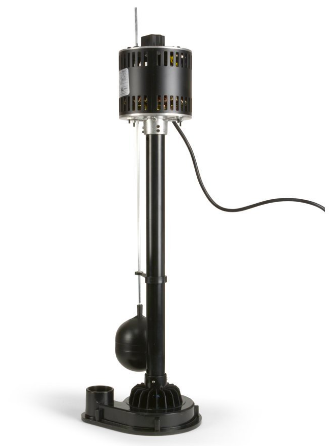 The Liberty Pumps 280 is a multi-purpose, submersible sump pump that’s one of the reasons for the brand’s reputation. Unlike our top-rated residential sump pump above, the 280 is suitable for both your basement and effluent pumping applications like STEP septic systems. It handles solids up to 3/4”, making it a good choice for dirty jobs like those. Its 1/2HP motor is attached with a 416 stainless steel rotor shaft to a Vortex impeller pump. Its vertical discharge develops up to 37 feet of total lift. The easily-removable intake screen is also made of stainless steel. The cast iron housing is epoxy powder coated to resist corrosion. An integrated float and switch and bail handle make help speed up installation and maintenance. In our opinion, this versatile, well-built sump pump epitomizes the quality and power of the company’s line and deserves our number one rating here. 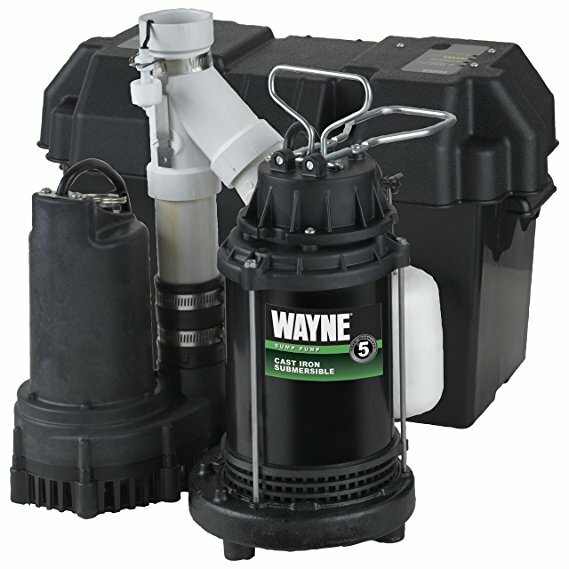 Wayne sump pumps are well-known and widely used in residential basement applications throughout the United States. We chose to feature their WSS30V because it’s one of the few complete primary + backup systems available. This is an excellent solution for a first-time pumping solution or to replace a system that isn’t doing the job well. It includes everything you need except the deep-cycle battery and of course, a sump basin. If you’ve got a 15” or larger sump basin, you can simply “drop in” a 1/2HP primary pump (3,150gph @ 10′) and a 12V backup pump (2,300gph at 10′). The pumps are pre-assembled with heavy-duty check valves, a discharge “Y” connector and flow sensor. The float and switches are integrated, so the entire kit is incredibly easy to install. The float switch is preset at about 4” off and 9” on, but is also user adjustable. There’s much more to know about this kit and you can find it all out by following the link above. For the purposes of our reviews, we’ll just award it the “best in class” from this manufacturer. Here’s another manufacturer that makes a line of high-quality sump pumps for multiple applications. We’ve chosen their EP0411A effluent pump to feature, because it’s one of the most powerful available. As the name suggests, this unit is suitable for a wide range of applications that includes high-volume residential sump drainage. At 1-1/2HP, it might be overkill for some systems. If you’ve got a serious water problem, however, this is a great solution. Of course, it’s also capable of performing as a submerged septic tank pump or in any other dirty water application. It comes with an integrated float and switch, so it can be easily used as a replacement pump in existing systems, if you’ve got the discharge plumbing to handle this kind of output. If your sump pump needs aren’t quite this significant, check out the other options available from Goulds. If you need a beast, follow the link above to check this one out. As the brand name implies, Utilitech specializes in sump pumps that deliver performance without a lot of frills. The Pro 1/3HP submersible sump pump is a great example. What we’re featuring here is a 1/3HP, cast iron pump with a built-in vertical float and switch. The base is elevated on 3 legs for suction clearance. It’s also equipped with a 10-foot power cord to provide enough reach for most installations. With a maximum flow of 3,600gph @ 0ft of lift, this makes a good primary sump pump for most locations. It’s equipped with a vertical discharge port and a vortex impeller that passes stringy materials up to 1/2” in size. This is a good choice when you need an inexpensive, but rugged replacement for a failed pump. We’ve highlighted it because it represents the basic, durable and powerful product this company does best. Check it out if that’s what you’re in the market for. Zoeller is a mainstay brand for many contractors. With that in mind, we’ve selected our top choice for this brand based on bulk pricing as well as product quality. The Zoeller Mighty Mate M53 is one of the most popular choices among plumbers and builders for low-to-moderate volume applications. It’s a time-tested, well-proven 1/3HP submersible sump pump that’s set a standard for cost/quality ratio. With this 4-pack, contractors can save even more. Each pump is a vertical-discharge motor and pump combination in cast iron housing. The float switch system is integrated and the switch housing is also cast iron. The oil-filled motors are thermally protected. An epoxy powder coat finish helps reduce corrosion. The thermoplastic impellers are vortex-style for maximum clearance and flow. Nine-foot power cords facilitate easy power access in most installations. This pump is a good choice for any pro or DIY installation or replacement. The pricing for the multiple-unit package makes it an excellent economical choice for the contractor who likes to pass on savings to the customer. In the arena of economical sump pump brands, Flotech stands out as a problem solver. Our top choice for this brand solves two problems: cost and ease of installation. The 1/2HP FLOTC kit is a simple and cost-effective solution for homeowners or pros. It’s a lightweight, medium-duty submersible sump pump that comes complete with a discharge riser and check valve. Although it’s economical, this thermoplastic-housed pump moves an impressive 3,000gph @ 0′ of lift. That’s sufficient for average residential applications. The integrated vertical float and switch are preset to 3” off and 7-1/2” on. Attached to the 1-1/2” pump discharge are a PVC riser, boot-type connector and a check valve. This allows for easier installation as well as reduced parts costs. With an 8′ power cord also attached, this is a drop-in, connect and run solution. If you’re looking for an inexpensive way to protect your basement from flooding, this unit will make the job easy. The name says it all for this brand. Little Giant submersible pumps pack power and reliability into small packages. We’re showcasing their 6EN-CIA-SFS because it delivers all of that with a float switch attached for reliable operation. This little, USA-made powerhouse is driven by an oil-filled motor with automatic reset on overload. It also draws less current than most making it more economical for you. The pump provides 50gpm (3,000gph) @ 5′ of lift. It even boasts a maximum lift of 22′. That’s respectable performance from a pump that stands just over 10” high. Corrosion-resistant epoxy powder coating protects the heavy cast iron housing. A vertical 1 -1/2” discharge helps maintain full volume. The float switch starts the pump at 7” to 10” of water level and stops it at 2” to 5”. If you need reliable performance and durability with a small footprint, this submersible sump pump is just what the plumber ordered. In the final analysis, choosing the best sump pump usually starts with determining its purpose. Specifically, it’s a matter of whether you need a primary or backup pump. We’ve covered both scenarios in this article and we believe the best choices for each are already mentioned. Since we promised to select one pump as the best value for your money, and we don’t like to go back on our promises, here goes: the absolute best pump for you money is the Wayne WSS30V. What’s more, the entire unit comes pre-assembled. Just drop it in a 15” or larger diameter basin and hook up the power and external plumbing. You’ll save money and time, not to mention the value of protecting your basement and its contents. Invest in yours here.